Snow on the Alder Hills, a photo by The Bacher Family on Flickr. 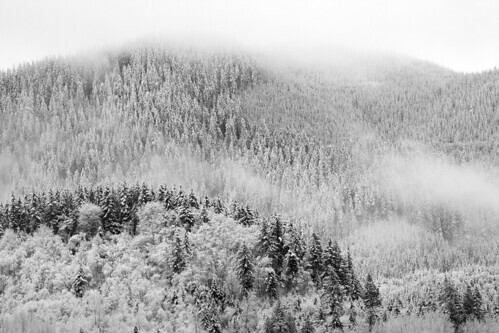 Snow on trees is a study in contrasts, and in the low light of a winter's morning with low clouds drifting through the treetops, it's a monochromatic scene that begs for the simple geometry of black and white. Looking over several versions of this image to choose my favorite, it really comes down to an intuitive sense of balance: the whiter deciduous trees in the lower left foreground balancing with the whispy white clouds in the upper right, the whole set creating multiple layers stretching away into the distance.